Beautiful 12 Page Brochure design, gloss laminate. Great design. Team Glow thrive on challenges, especially design ones. 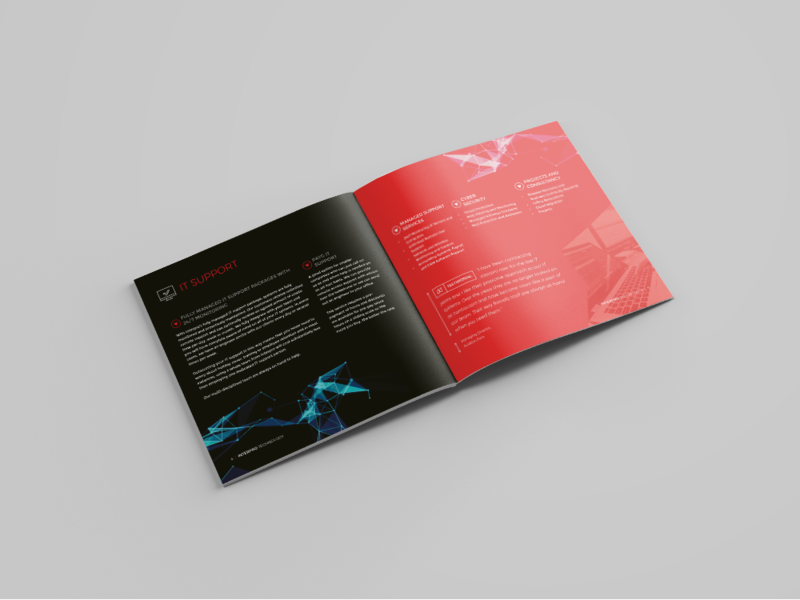 So, when we were approached by our fabulously talented web developer company, Interpro Technology to create, develop and print a 12-page brochure design in just 2 weeks we jumped at the opportunity! 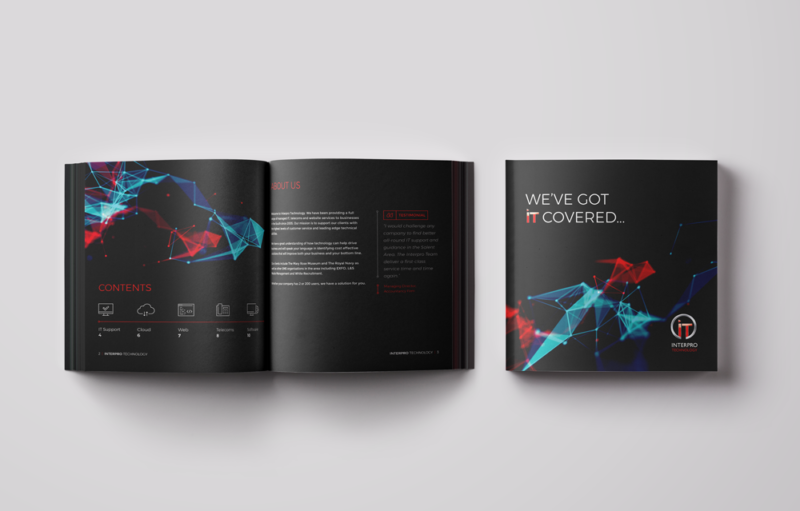 For this gorgeous new service brochure, Interpo’s brief to Glow was to design a high end, cool (in style) and succinctly laid out overview of their services. We also needed to showcase client testimonials and their breadth of capabilities. We chose to create a square, 12-page brochure design, with a matt laminate gloss cover. Not only does it look just lovely, it has as great texture too which makes you want to delve in and read. Glow and Interpro have been working together for a while, partnering on design and web development services. And the Interpo Technology team are a perfect match for Glow; proactive, bang on professionally and super friendly too. Knowing how Interpro work was added reassurance that we would be able to deliver a top job in just 10 working days. Managing Director of Interpro Technology, Mark Abrams, was tasked with writing the full brochure copy in one evening and did just that. We’re not sure if gin was involved in the creativity and speed but, as promised, full, proofed copy was delivered 9am the next day. 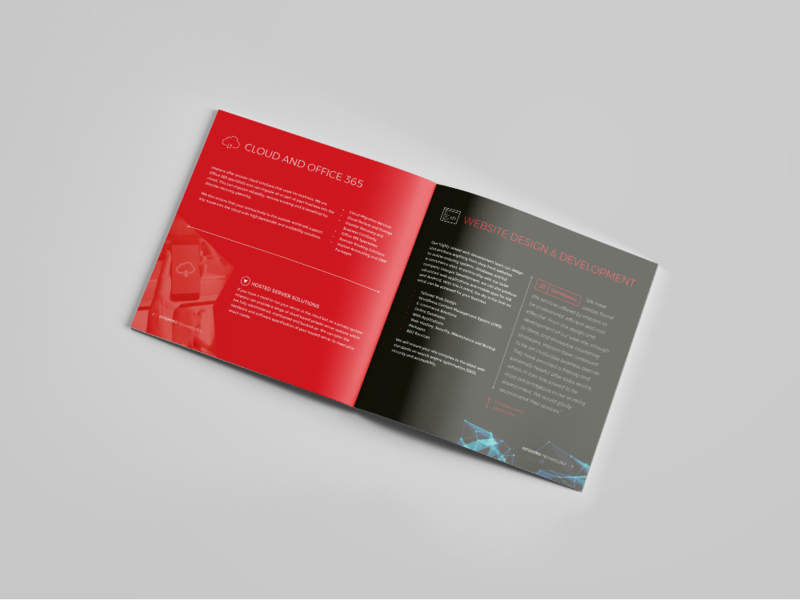 This, coupled with clear, quick feedback ensured we could design, artwork and print the brochure on time, and in fact deliver a day before it was due. Interpro Technology provide a full range of managed IT, telecoms and website services. They will be using the brochure at events, online, and for business development meetings. It shows off what they’re great at and we hope it brings them much deserved success.